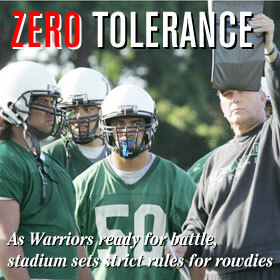 University of Hawaii football coach June Jones, right, set up a play for the defense yesterday during drills. Tomorrow’s game against Boise State starts at 4 p.m. at Aloha Stadium. Meanwhile, stadium officials have plans in place to deal quickly with any disruptive fans.